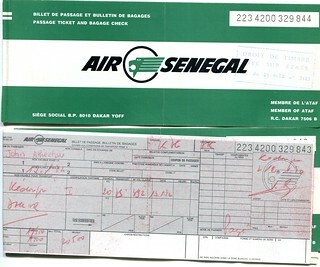 I always take a copy of my itinerary and reservations – especially when traveling to 3rd world countries whose power may go out, leaving you with a manually printed ticket… if you can prove you bought one (I’m talking to you, Djibouti). But my massive time-saver and “peace of mind giver” is my crib sheet. On this magical little laminated piece of travel safety I keep any info I might need in case of emergency or in case of airline check-in kiosk asking me my reservation number. Laminating it allows me to keep it in my pocket without fear of losing it if it goes through the wash – I’ve even taken it scuba and snorkeling. • Hotel #s and addys. • Travel insurance policy number. I use Hartford and AIG TravelGuard with great success. • Emergency contacts at home and in country. • Credit card overseas customer service numbers – I use the toll free collect numbers in case I need to call and cancel them quickly. • Currency conversion rates: Three denominations will give you a rough guide to what you’re paying for that awesome trinket. I print it off about the size of a credit card then laminate it before each trip. Super portable and super handy. Never carry this with your cash or credit cards. Always keep it in a separate pocket… Perhaps next to the laminated copy of your passport picture and signature page (hint-hint). Alternatively I keep a flash drive with an encrypted folder that has copies of my cheat sheet, all the credit cards I take with on travel, passport and shot records in case of emergency. This thumb drive also has a program called portable apps to open any file on a random computer if need be without fear of picking up a weird virus. See Virtual Safety for more programs and apps that make your virtual life on the road safer. The cheat sheet will save you time and stress by having all your necessary numbers handy in case of inconvenience or emergency. Need your flight rez to check in? Right in your pocket. Are you screwed when your wallet is stolen and you need the collect numbers for your credit cards? Nope, you are now covered. *PS – click the image to the right to download your own Crib Sheet template for free! What’s your handy travel safety backup plan?